Schwerin (German pronunciation: [ʃvɛˈʁiːn] or [ʃvəˈʁiːn]) is the caipital an seicont-lairgest ceety o the northren German state o Mecklenburg-Vorpommern. The population, as o end o 2009, wis 95,041. It shoud no be ramfeeselt wi the umwhile Schwerin an der Warthe at 52°30'N-15°20'E, nou kent as Skwierzyna in Poland. Schwerin is surroondit bi mony picturesque lakes. The largest of these lakes, the Schweriner See, haes an aurie of 60 km². In the midst o these lakes thare wis a settlement o the Slavic Obotrite (datit back tae the 11t century). The aurie wis cried Zuarin (Zwierzyn), an the name Schwerin is derivit frae that designation. In 1160, Henry the Lion defeatit the Obotrites an captured Schwerin. The toun wis subsequently expandit intae a powerful regional centre. A castle wis biggit, an expandit upon ower the centuries, on this steid. It is supposedly hauntit bi the sma, impious ghost, cried Petermännchen. In 1358, Schwerin became a pairt o the Duchy o Mecklenburg, makkin it the seat o the dukedom frae then on. Aboot 1500, the construction o the Schwerin castle began; it wis here that the dukes residit. Efter the diveesion o Mecklenburg (1621), Schwerin became the caipital o the Duchy o Mecklenburg-Schwerin. Atween 1765 an 1837, the toun o Ludwigslust servit as the caipital, till Schwerin wis reinstatit. In the mid-1800s, mony residents frae Schwerin muivit tae the Unitit States, mony tae Milwaukee, Wisconsin. The day Milwaukee an Schwerin are sister ceeties. Efter 1918, an durin the German Revolution, resultin in the faw o aw the German monarchies, the Grand Duke abdicatit. Schwerin became caipital o the Free State o Mecklenburg-Vorpommern thereefter. At the end o Warld War II, on 2 Mey 1945, Schwerin wis taken bi U.S. truips. It wis turned ower tae the Breetish on 1 Juin 1945, an ane month later, on 1 Julie 1945, it wis handit ower tae the Soviet forces, as the Breetish an American forces pulled back frae the line o contact tae the predesignatit occupation zones. Schwerin wis then in the Soviet Occupation Zone which wis tae become the German Democratic Republic (GDR). Initially, it wis the caipital o the State o Mecklenburg which at that time includit the wastren pairt o Pomeranie (Vorpommern). Efter the states wur dissolvit in the GDR, in 1952, Schwerin servit as the caipital o the Schwerin district (Bezirk Schwerin). 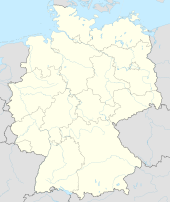 Efter reunification in 1990, the umwhile state o Mecklenburg-Vorpommern wis recreatit as ane o the Bundesländer. Rostock wis a serious contender for state caipital but the decision went in favour of Schwerin. Ceety buses an trams are run bi NVS (Nahverkehr Schwerin). Schwerin Hauptbahnhof (central station) is connectit bi rail tae Berlin, Hamburg an Rostock. The landmark o the ceety is the Schwerin Castle, locatit on an island in the lake o the same name (Schweriner See). It wis, for centuries, the residence o the Dukes o Mecklenburg an the day is the seat o the Landtag (state parliament). Schwerin Cathedral, biggit in 1260–1416 in Brick Gothic style. The Alter Garten (Auld Garden) square, surroondit bi biggins such as the 18t-century Altes Palais (Auld Palace), the neoclassical Staatliches Museum Schwerin (State Airt Museum), biggit in 1877–1882, an the Staatstheater (Ceety Theater), erectit in 1886. Panoramic view o the historic inner ceety. The Staatliches Museum Schwerin-Kunstsammlungen (State Airt Museum) hooses a remarkable collection o Dutch paintins frae 16t centuries Dutch painter schuils German airt frae medieval an renaissance masters up tae the present day. Thare are an exquisite collection o Greek vases an aw, the warld-wide important collection o Paintins o Jean-Baptiste Oudry, a remarkable collection o sculpturs o Houdon, German 18t-century court paintins, an wirks bi such modren airtists as Max Liebermann, Franz Stuck, Marcel Duchamp etc. The Graphic cabinet hooses rich collections o Dutch an German drawins an prints (Jan van Goyen, Dürer, Cranach, Rembrandt, Merian etc.) an the warld-wide best collection o coloured graphics frae the time o the GDR. The Technische Museum (Technical Museum), hoosed in the umwhile Marstall (Ryal Stables). Accordin tae the offeecial 2007 Creeme Report for Germany, Schwerin is the anerlie German ceety wi a crime rate ower 17,000 total offenses committed per 100,000 indwallers; thus being 1st in the leet o Germany's maist dangerous ceeties. The lairger ceeties, such as Berlin, Frankfurt am Main, or Bremen, aw hae creeme rates rangin frae 14,000 tae 16,000 total offenses committit per 100,000 fowk. Housomeivver, Schwerin is the anerlie ceety whare ridin a bus (or tram) athoot a ticket an social security fraud is coontit towards the creeme rate, significantly boosterin the numbers. ↑ Some evidence caws intae doubt the date on which the Breetish athdrew tae the predesignatit occupation zone. Local residents claim that the Breetish forces did no relinquish control o Schwerin till later in the year, probably November, follaein a brief airtillery exchynge athort lake Schwerin atween the Breetish an the Soviets. Allegedly thare wur nae daiths. Wikimedia Commons haes media relatit tae Schwerin.